Nutmeg's owner first came to TLS for help in January 2014, just hours before Nutmeg was due to be put to sleep because of rotation following probably years of chronic laminitis. The story of Nutmeg's first reprieve from euthanasia can be read here. TLS continued to follow Nutmeg's rehab, but she wasn't making the progress expected and still required daily pain relief. During the summer it became clear that her trim wasn't quite correcting her feet, her heels were still too high but her collateral groove depths at the apex of her frogs were shallow. Before and after trimming - little change in the hairline angle suggests the palmar angle hasn't been significantly reduced and there is still rotation. 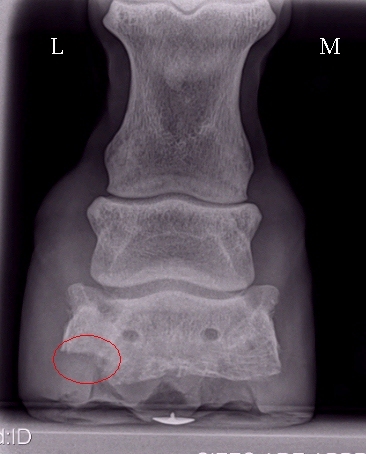 In July Nutmeg's owner reported that her new vet, having seen the x-rays taken in January, had said that the pedal bones were pointing down to the ground and that nothing could be done about this. Apparently suggestions were made that Nutmeg had been in pain for years, it wasn't fair to keep her like this, and it was time to "let her go". 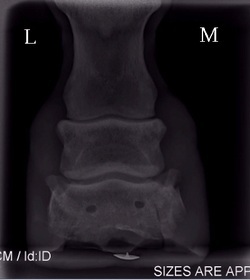 More x-rays were needed but weren’t felt to be an option by her owner due to an expensive quote and the worry that they might be misinterpreted by anyone not familiar with laminitis rehabilitation. TLS knew from photos that Nutmeg's feet had not been fully realigned. 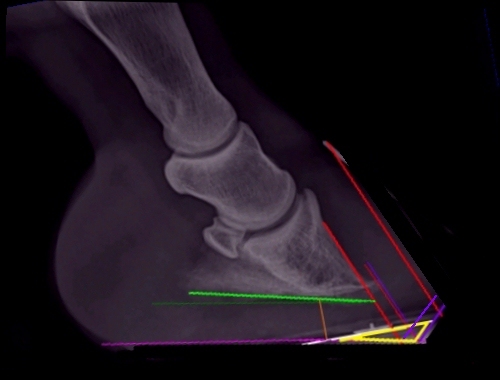 Before making any life or death decisions, it had to be worth getting new x-rays to assess the damage to her feet, and carrying out a realigning trim. TLS offered to take Nutmeg for rehab, and she arrived, wearing thick pads and boots on a deep supportive bed, at the end of August. On arrival Nutmeg's PPID/insulin resistance was clearly not fully controlled. She had a cresty neck with a dip in front of the withers, filled supraorbital hollows and puffy eyes, fat pads behind the shoulders and around the tailhead. Her ribs were visible despite a thick and slightly staring coat, with a pot belly. Her hind legs were tucked well under her body, giving her quarters a rounded appearance and making her tail look too low set. She was paddling slowly with her front legs, and her hind legs never rested. Although she had walked across the yard reasonably well in her boots and thick pads for a pony that supposedly should be put to sleep, she had a slightly odd gait behind and her back end looked awkward and disconnected from her front end. She was very cold to the touch along her topline, quarters and legs, and objected to being touched behind the saddle, on her belly and on her hind legs. Daily TTouch body work sessions and gentle massage were started immediately. ACTH (62.5 pg/ml - normal <47), insulin (169.0 mIU/l - normal <20) and glucose (5.5 mmol/l - normal 2.3-6.8) were tested at Liphook and confirmed that her PPID and insulin resistance were not under control. Her Prascend dose was increased, and her diet reviewed to try to reduce her insulin levels (Nutmeg's new diet consisted of hay, Dengie HiFi Molasses Free, unmolassed sugar beet, Spillers Lite balancer, micronised linseed, salt and yea-sacc). X-rays were taken of both front feet and showed palmar rotation (green - around 18 degrees on the left fore and 15 degrees on the right fore), sinking (yellow) and bone remodelling, but no one had anticipated the large amount of bone loss that was seen on the outside of the right fore pedal bone! 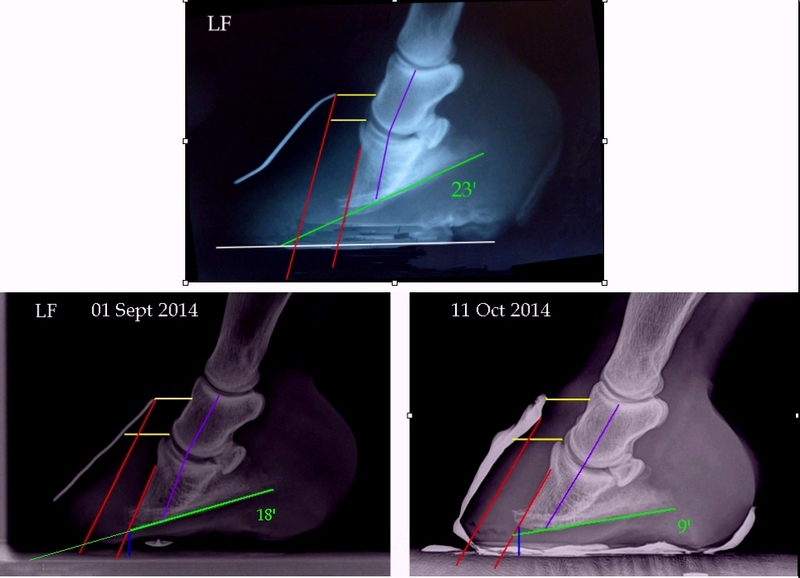 An expert second opinion was sought from the USA, backing up TLS's view that despite the bone loss the feet looked perfectly salvageable, and ending "I simply don't get why PTS. We see such horrid feet that end up being success stories. If she's comfortable, then the problem with her staying alive is, what?". Indeed! LF LM x-ray showed true dorsal rotation of around 7 degrees (red/pink - although the laminar wedge made it seem more than this, breakover had already been brought back); palmar rotation of around 18 degrees (green); sinking (yellow). The bony column was surprisingly straight (purple). 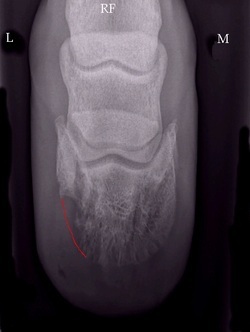 Bone remodelling (ski tip) circled in red. RF LM x-ray showed no true dorsal rotation (red/pink - although the laminar wedge made it seem more than this, breakover had already been brought back); palmar rotation of around 15 degrees (green); sinking (yellow); slight bony rotation (purple). ..as did the 0 degree DP view of the RF. 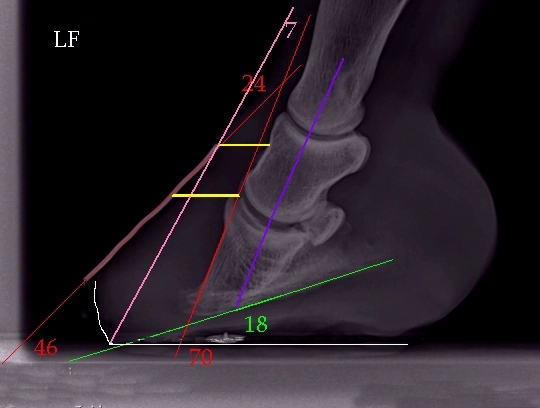 The realigning trim entailed bevelling the toe to the purple line, lowering the heels gradually to the pink line, and bevelling the outer wall so that weight bearing was shared by the well padded and supported solar structures (frog, heels, bars, sole). 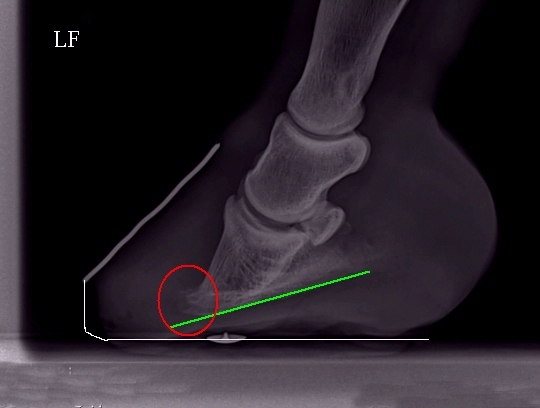 Note the area marked yellow had to develop - foot rehabilitation is often about growing hoof just as much as trimming hoof. Corrective trimming was carried out initially weekly and then every two weeks, following mark-ups prepared by TLS. Nutmeg was given lots of breaks while being trimmed and not asked to hold her feet up for longer than she was comfortable with. Nutmeg's feet were protected by boots and pads whenever she was not on supportive bedding, and closely monitored for changes. Despite having had her teeth checked by a vet in May, Nutmeg was salivating excessively and dropping food and hay, and EDT James Arkley kindly agreed to carry out a full check and float at short notice, finding and removing several sharp points and ramps, after which she was able to eat more comfortably. Nutmeg often felt cold despite her thick coat, and after appealing for small rugs, TLS was kindly loaned stable rugs and fleeces by Norfolk Equine Veterinary Services. As Nutmeg's stance improved following the realignment of her feet and regular body and then ground work, it was interesting to note that the initial rugs borrowed became too short by about 12" - her back end was uncurling! When Nutmeg arrived she was used to eating her hay from a box on the ground, but she was introduced to having haynets hung around her stable to encourage her to "graze", to reduce pressure on her front feet, and to encourage her to move around. Nutmeg had been on NSAIDs (Danilon) for years, but as she became more comfortable this was slowly reduced and then stopped altogether. There are significant side effects associated with the use of NSAIDs, and their use should generally be kept to a minimum (see Phenylbutazone). Once her feet were well on the way to being realigned and she was comfortable off of NSAIDs, Nutmeg began in-hand walking wearing boots and pads, starting with one circuit of a small paddock twice a day, and building up by a lap every day. 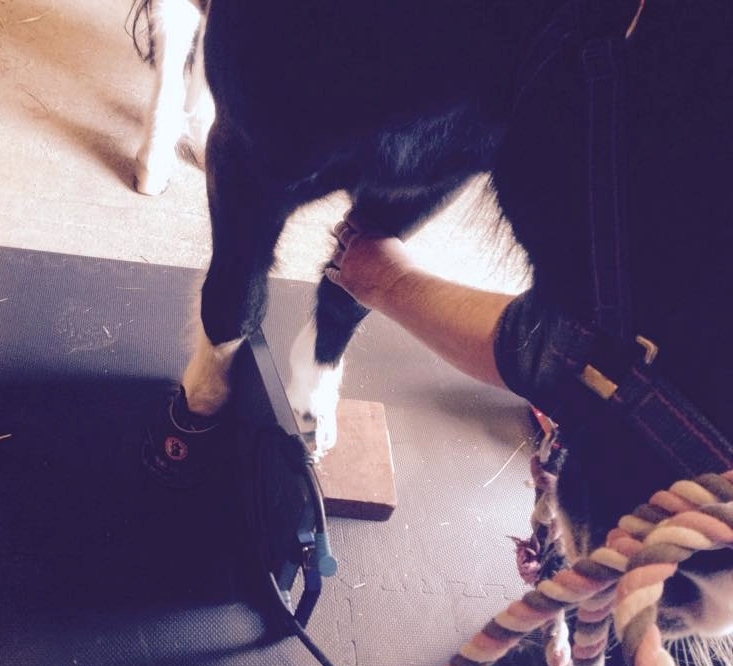 Before each walk Nutmeg had a TTouch bodywork session to help warm and relax her muscles, she wore rugs if necessary to keep her muscles warm, and she was monitored closely for increases in digital pulse "boundingness" and any signs of discomfort. 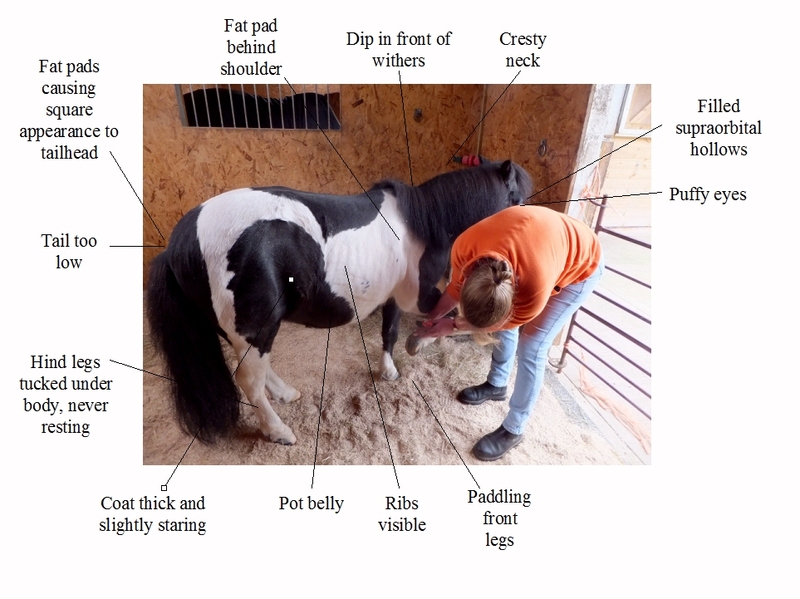 TTouch sessions generally started with feeling Nutmeg's body for hot/cold areas, then a variety of light TTouches including Python Lifts on her legs, Zig Zags across her back and belly, ear work and tail work, and body wraps were used both in the stable and during exercise. 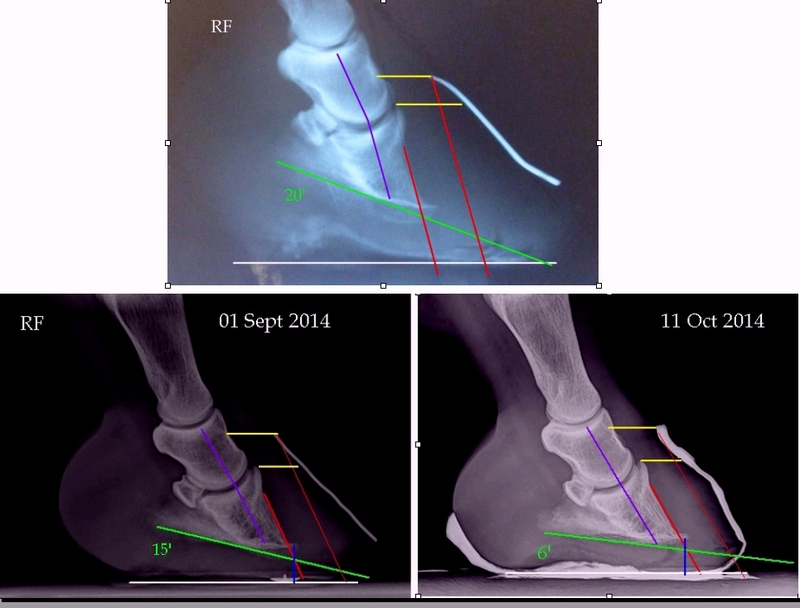 Further x-rays in October showed that Nutmeg's feet were almost fully realigned - the left fore just needed a little more to come off both toe and heels in the next trim. At the end of her 7 week stay Nutmeg's feet were realigned, she no longer had "no go" areas, was off all NSAIDs, and was comfortable walking at least 20 minutes a day. Her weight hadn't changed (using a weight tape), but the fat pads behind her shoulders and around her tail head had reduced, as had her crest which was softer and the dip in front of her withers less obvious. She seemed less pot bellied, appeared to have gained some topline and her coat condition appeared to have improved. Follow up blood tests showed that her ACTH and insulin levels were still above normal, probably due to being tested at the height of the seasonal rise, and her medication was adjusted accordingly. Nutmeg is now back home with her family, who will continue her rehab following TLS's suggestions for diet, management, bodywork, exercise and foot care, in conjunction with their own team of professionals. Nutmeg walks confidently to the lorry - only 2 months earlier vets were advising she should be put to sleep. Soon after her return home, Nutmeg's owner commented: "the biggest difference that I have seen in all of this is Nutmeg coming off painkillers for the first time in 7 years and being able to see her walk better than she did when on the painkillers! I feel that Nutmeg can finally move forward as everything is in place for her to do so. It has been a battle to get where we are today going against the opinions of two different vet practices but you should never give up trying to put things right if you think there is a slight chance that it is possible, no matter what anyone tells you. Nutmeg is proof that it can be done!" "The best present I have had is this video taken yesterday of my little Shetland pony called Nutmeg. It has been 15 months now since The Laminitis Site gave me all the hope and help I needed when two different vet practices wanted to write her off but I refused to give up on her. I hope you enjoy the video clip of me taking Nutmeg for a walk..or is it the other way round?!" Nutmeg certainly looks full of life! Can you help with future rehabilitations? 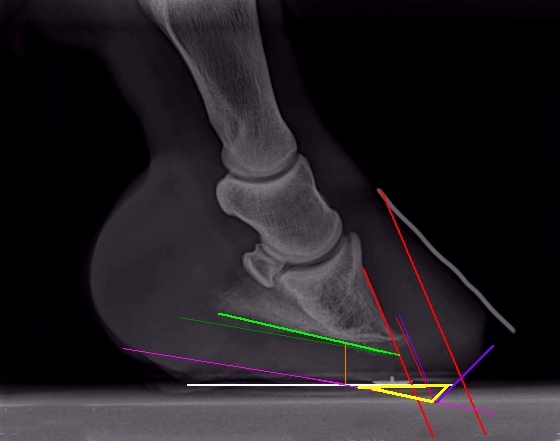 The Laminitis Site relies upon donations to fund rehabilitations and research - this work provides important information that will help future cases of laminitis. 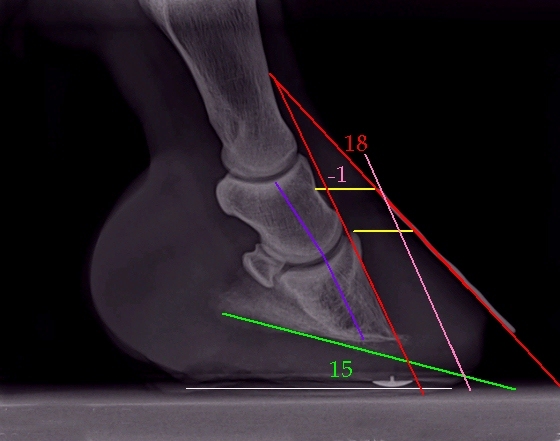 If you would like to support The Laminitis Site and help horses recover from and ideally avoid laminitis, information about making a donation can be found here or by using the Paypal Donate button.